Happy Birthday Sister in Law! It’s easy to write this short wish, but what about going one step further and writing something that will have some true meaning and be memorable? Sister in laws interact at different levels. For some, every time you face some kind of trouble, she is around to give you advice or a helping hand. A person like you can be one of the best friends that you can ever find. She may not be related to you in the blood, but she can prove to be much more than that when a need arises. If it is your sister-in-law’s birthday, make sure to shower the best words on her. 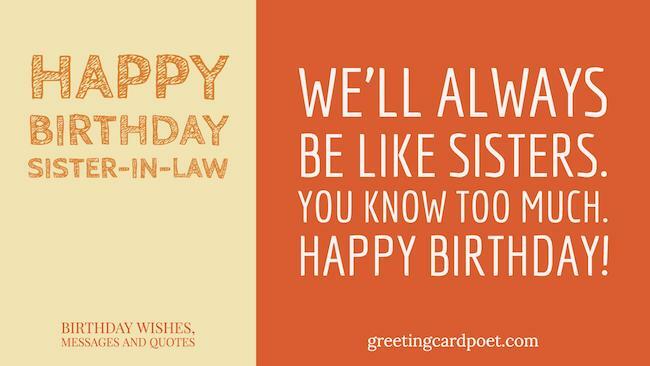 Here are some beautiful happy birthday wishes and messages for your dear sister-in-law. May your day be as beautiful as you. Hugs, kisses and birthday wishes Sweety! Wishing you the most magnificent, amazing, incredible, sensational, talked-about and brilliant B-Day! You deserve it! Folks like you are one in a million. Can’t say enough how much I’ve loved getting to know you and the true friend you’ve become. I love seeing the joy on your face, you’re an amazing sister in law, and today is your special day! Have a great one! Asking God to bless you with every kind joy on your special day. Thank you for giving so many reasons to smile. May you have many, many more good years, grand times and great memories to share! HBD! If I had the chance to choose any one to marry my brother, I would choose no other person than you! Happy Birthday Wishes for my very special sister-in-law! You’re one of my favorite people in the world. Not only was I blessed with a great husband, but also with an awesome sis in law. Life gave me a wonderful package deal and I’m forever thankful! You’ve enriched by brother’s life and for that I’m forever grateful to you. Have a special day! We’ll always be like friends — you know too much. Happy B-Day to the Best! You are not old; you are retro! Age is just a number, but don’t worry the fire department has been notified about your cake. Congratulations on surviving another year of my little brother! All the presents in the world do not capture what you truly deserve. Age: the number of years the world has been enjoying you! Your date of birth should be in history books! Ready for another round tripper around the Sun. It’s your big day – enjoy it! My dearest, I hope that you have a great day today, I wish you great luck and happiness. I’m so glad you’ve married by bro. I hope that this celebration brings you everything you could want and more! May all your dreams come true. Such a wonderful person like you deserves abundance of happiness, a bouquet full of blessings, a bag full of good health and a whole lot of love. Happy B-day to my sweet and lovely! This is a day that is a great blessing to us all. A time to celebrate you and your life. Hope you have bright and happy days over and over and over again! All the best to my dearest sister-in-law! Bring out that delicious chocolate cake. Open that bottle of wine. Let us celebrate your bright and new chapter ahead! Taking care of our brother is an enormous task; you do it with such class. Well done, and have a great day! Happy bday to my sis-in-law, you know that I love you much. I find myself frequently thanking my lucky stars that I can turn to you for advice and comforting words. My hope for you is that you are graced with tons of magical moments on your special day and always. Do you know how much we love you? You are the most lovely sister-in-law in the world. It’s true that in the beginning we didn’t know each other well, but now I can tell that I know you and I am grateful of having you in the family. I admire you and consider you a great friend. I wish you the best. Calling you a sister-in-law doesn’t really do our relationship justice. You are more like a great friend and the sister that I never had! Thanks for being you! Don’t ever stop being yourself. Happy Birthday Sister in Law! I am so very thankful and so very fortunate to have you in my life. To an amazing person, and a great friend, too. I hope that you enjoy the beauty of the day, because the anniversary of the day you were born is a very special one to me. We can’t really explain what you have added to our family. It’s a certain kind of brilliance that only someone like you could deliver. We are grateful to have you in our lives and love you dearly! I’m so excited to celebrate your birthday with you. A wonderful person deserves a wonderful birthday. I love you much and remember that you can count on me always for everything. You’re a great person and why I love you so much. I want to tell how much you mean to me – and, that’s a lot. If you think that I would ever forget about your birthday, you are wrong! How could I ever forget someone who brings such joy to our lives. In this new year of life that God gives you, I want to say that I wish you many fantastic returns. You’re like a sister to me, and I love you so much! I am glad that we are very close. I wish you much happiness on this day and I ask God to help you to make all your dreams come true. Thank you for all you’ve done for me. It’s great to have someone that I can talk about anything with. You always have the right words, sage advice and a great sense of understanding. Hope you have the happiest of days! Link: Getting along with your sister-in-law. Today is a special day so I want to wish you a lifetime of happiness. God will bless you much because you are a wonderful person. Now, get your happy Bday on for your birthday party! As time goes on we become closer and closer. What a great feel for having such a nice friendship with you. Hope you have a nice birthday sweets! I have learned so much from you, and I can hardly believe what a blessing you’ve been to our entire family. Heaven must’ve sent you from above. I am blessed to have met such a nice and beautiful soul. You mean so much to me, you mean so much to all of us. You’re a wonderful sister in law! You’re on Happy Birthday Sister in Law page.